Barcelona, the historic capital of Spain’s north eastern Catalonia region is host to a diversity of architectural styles ranging from ancient to modern. Originally a Roman settlement and now one of Spain’s busiest ports, the heart of Barcelona’s old city is particularly rich in Gothic architecture thanks to the work of revered Catalonian architect Antoni Gaudi. No trip to Barcelona could be complete without taking a visit to Gaudi’s magnificent – and as yet, unfinished – Sagrada Familia. 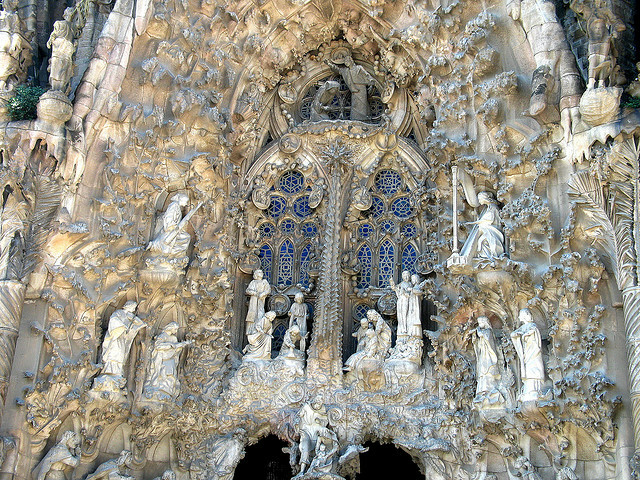 The largest and most inventive of Gaudi’s works, the Sagrada Familia (literally, Sacred Family) is a Roman Catholic church located on Calle Mallorca. Begun in 1882, this breath taking building has been described as Dali-esque thanks to its surreal styling and organic-looking embellishments and is Barcelona’s most visited landmark, attracting around two million visitors every year. Arguably no less impressive, but somewhat older than Gaudi’s masterpiece, is the Cathedral of Santa Eulalia or simply ‘Barcelona Cathedral’. Dominating the Gothic Quarter of the city, this fourteenth-century place of worship is an outstanding example of Catalan Gothic architecture featuring high gothic arches, a collection of gargoyles based upon both factual and mythical creatures and a beautiful gardened cloister, beneath the timeworn stones of which lie the tombs of the Gothic Quarter’s original Guildsman. You could be forgiven for thinking that the Hospital de Sant Pau (Hospital of St Paul), a short walk from the Sagrada Familia, was another church such is the beauty and grandeur of its architecture. However, the building is less than one hundred years old, and was designed by Catalan Modernist architect Lluís Domènech i Montaner. Drawing on Gothic and neo-Gothic influences, the red-brick Hospital de Sant Pau is rich in fine architectural detail from the broad stairway at the entrance to the arches, columns and ironwork within. Although no longer functional as a hospital, the building is of such historic and cultural importance that it has been deemed a UNESCO world heritage site, and is beginning a new life as a museum and cultural centre. Whilst central Barcelona is steeped in well-preserved mediaeval and classical architecture, there is no shortage of fascinating modernist architecture to admire. One of the more recent additions to Barcelona’s skyline is the Agbar Tower, opened in 2005. Reminiscent of a silver missile, the 142-metre high tower was designed by French architect Jean Nouvel and dominates the Plaza de las Glories Catalana, marking the gateway to Barcelona’s emerging business and technological district. Initially provoking controversy amongst residents of Barcelona due to its radical difference in style from any other building in the area, the Agbar Tower has gradually gained acceptance and is stunning to behold by night, when the entire structure may be illuminated in a range of colours by more than 4,000 LED lighting systems. A similarly iconic example of Barcelona’s modern architecture is Peix (Fish), a vast sculpture of stone, steel and glass created by Canadian architect Frank O. Gehry for the 1992 Summer Olympics. Situated at the foot of one of Barcelona’s tallest buildings at Port Olimpic, Peix looks out to sea. Thanks to the reflective properties of the materials used, Peix glitters and sparkles in the Spanish sunlight creating the shimmering effect of a fish in water and making the sculpture a visible landmark from many of Barcelona’s beaches. The structures referred to here represent a mere fraction of the sheer quantity and diversity of Barcelona’s architectural highlights; from the old city centre with its surviving Roman structures to the many and varied works of Gaudi and his peers scattered throughout Barcelona and to the thoroughly modern designed commissioned for sporting, recreation or business, no matter where you are in Barcelona an encounter with an example of stunning or influential architecture is inevitable. John the author of “The architectural highlights of Barcelona” is a historian and a full time archaeologist for Barcelona city.